THE ARTWORKThe story behind our branding and our beers. Aly and Ralf always knew that the look and feel of their brewery needed to embody them as people. 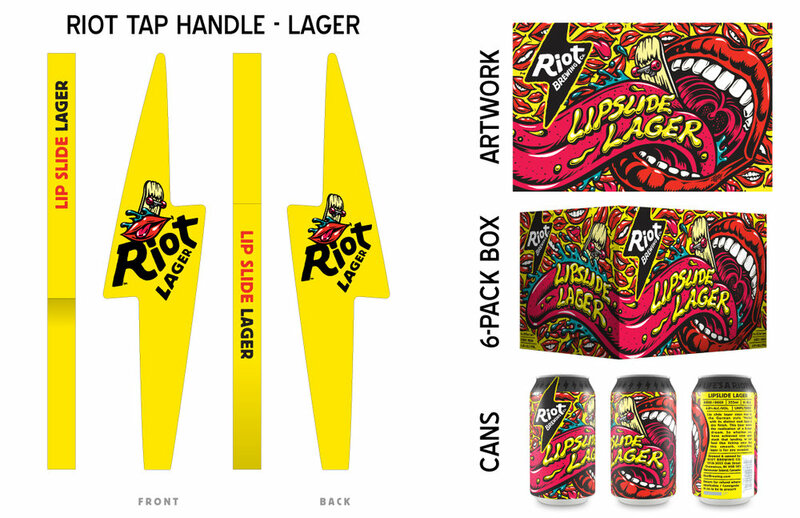 They wanted to infuse their backgrounds in craft beer, punk rock, and skateboarding into every aspect of the brewery and its products. They reached out to craft beer branding agency The Brandit for help. After reviewing what Riot needed, they decided to manage the project while looking for an artist who could provide artwork with counter-culture credibility. Who they found was Jimbo Phillips. Jimbo is the son of Jim Phillips, the creator of all of the artwork for iconic brand Santa Cruz Skateboards in the 70s and 80s, including the famous Screaming Hand logo. Jimbo was raised in an art-centric home and began learning from his father at an early age. Now he carries on his dad’s legacy, creating bold, impactful graphics for a variety of media. Including, of course, skateboards. 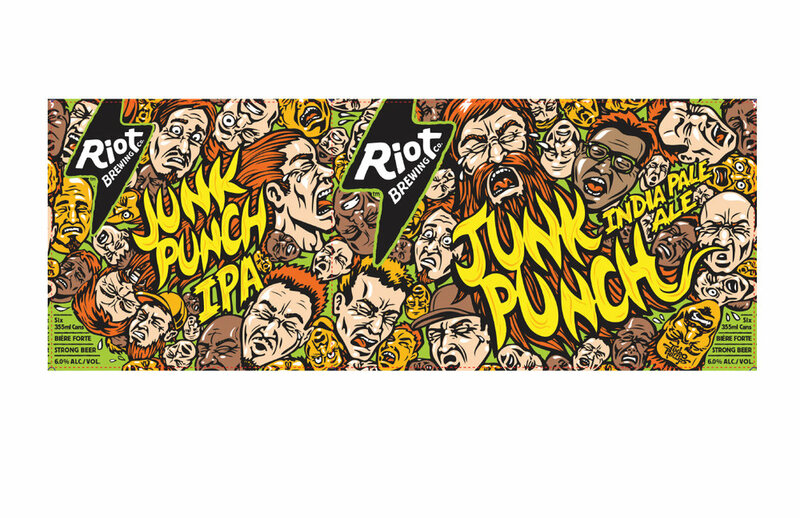 It was Jimbo’s first time doing beer labels and he knocked it out the park. Here’s a look at what Jimbo has done for Riot and the stories behind the names. A lipslide is a super smooth skateboard trick. Just don’t ask Ralf to demonstrate one. His skateboards are too nice and he’s way out of practise. A lot of people think Aly and Ralf are married. They’re not but they did date in high school for awhile. They stayed best friends, lived in the same apartment building, and eventually bought a house together in 2010. They’ve lived together ever since, along with their two dogs. They’re life partners, literally. 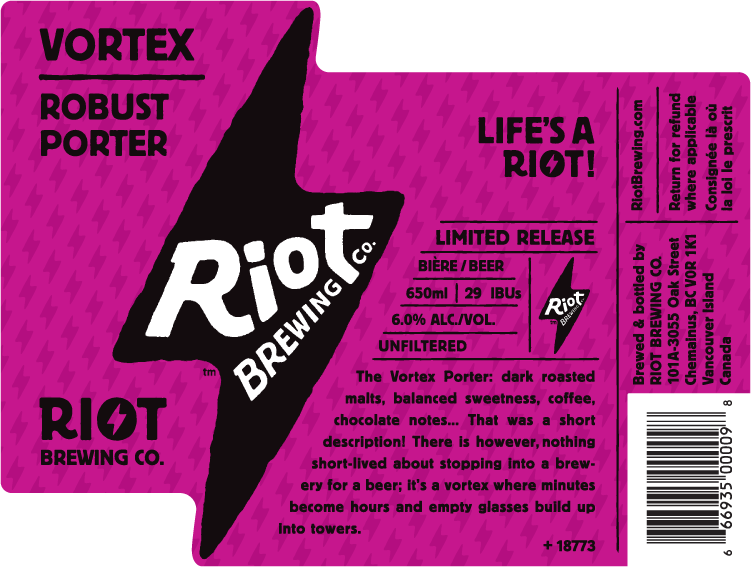 When Morgan signed up as the third owner of Riot Brewing Co., he became the third life partner, the adopted ginger stepchild. He just sleeps at his own place. Our IPA packs a punch, just like co-owner Aly Tomlin, a pioneer in Vancouver’s craft brewing scene. As one of the first female brewers in a field heavily dominated by men, the job of keeping everyone in line fell to Aly. A knock in the berries quickly became a rite of passage for Vancouver brewers; Aly thinks of it as a gesture of endearment. 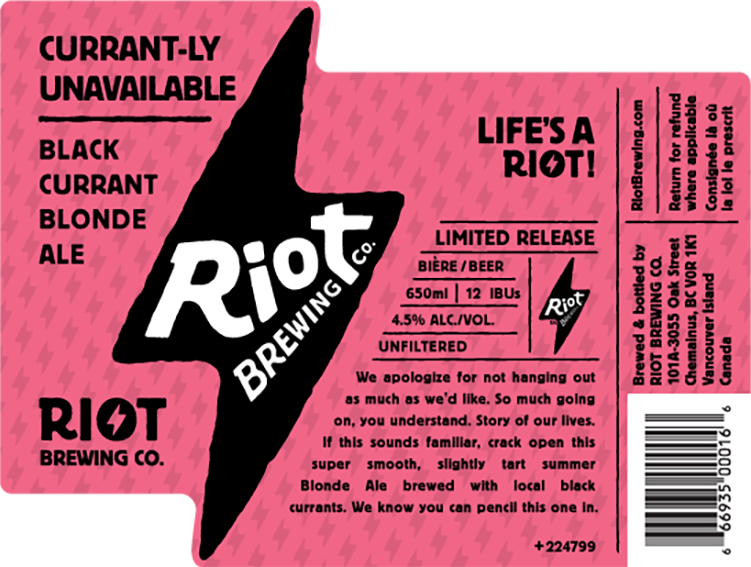 Many of the faces on the label are real people who will always be members of The Riot Squad. You want to know more about our upcoming events? Where to find our products? Why Riot? That's a lot of questions dude! Enter your email address and name below and we'll eventually send you one email a month (or not). Thank you, you know you made the right choice! By entering your email address on our website, you joined the Riot and we -the Riot Squad- are proud to have you in our team!